For every class you complete at DWC, you can download a certificate of completion from your student account under ‘My Classes’ (Past tab). Certificates are available 10 days after the end of a class and if a student has a passing grade. 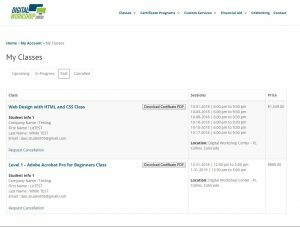 1 – Login: Head to the Digital Workshop Center website and login. For any class, if you have received a failing grade, then the “Download Certificate PDF” button is automatically hidden until this grade is set to “Pass” by DWC administrative staff. Questions? Contact us for more help.